Not many of us make it into the dictionary as an adjective. But then again, Rube Goldberg was no ordinary noun. He was a cartoonist, humorist, sculptor, author, engineer, and inventor, and in a 72-year career he wrote and illustrated nearly 50,000 cartoons. Goldberg (1883–1970) was the most famous cartoonist of his time, best known for his comical inventions, which were syndicated in daily newspapers throughout the world. Author Jennifer George celebrates all aspects of her grandfather's career, from his very first published drawings in his high school newspaper and college yearbook to his iconic inventions, his comic strips and advertising work, and his later sculpture and Pulitzer Prize–winning political cartoons. Also included are essays by noted comics historians, rare photographs, letters, memorabilia, and patents, many reproduced here for the first time. 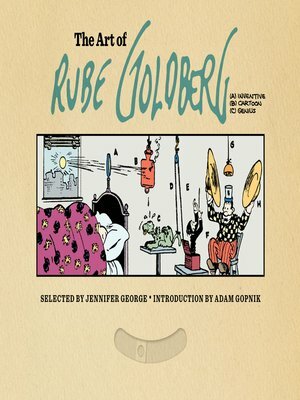 Brilliantly designed and packaged to capture the inventiveness of Rube Goldberg's work, The Art of Rube Goldberg is a coffee table book the whole family can enjoy. "Goldberg's cartoons touch the edge of modern art." Adam Gopnik,staff writer for the New Yorker, is a three-time National Magazine Award winner and author of many books, including Paris to the Moon and Through the Children's Gate. Jennifer George is the granddaughter of Rube Goldberg. She is the author of The Art of Rube Goldberg and a jewelry and clothing designer. George lives in New York City.